As many know, within the religious context the term “myth” does not necessarily mean fiction (as in “not true”). However, I have noticed that even within religious circles there is a tendency to link the term myth with fiction. Take, for example, the story of David and Goliath. I believe that the story of David and Goliath is based on history, but if I call it a myth, people tend assume that I am saying it did not actually happen. Therefore, I tend to like to say that a story has a mythic function, rather than saying it is a myth. The same can happen with the term “parable.” There is nothing in the term that says whether the story is based on fact or fiction. Thus the parable of Jesus about the Unjust Judge may or may not be based on a real woman in need of justice and a judge in need of a conscience. However, people tend to believe that a parable is fiction. Therefore, I would rather talk about a story having a parabolic function. MYTHIC: having the quality of supporting, justifying, or explaining a cultural value. PARABOIC: having the quality of challenging or contradicting a cultural value. Consider the story of David and Goliath. I believe it is a historical event, but it was told and retold because it had a mythic function. Ancient Israel saw itself as small compared to big and powerful nations around it. Yet it saw itself as having a special relationship with God, such that if it was faithful to God and courageous, Israel would be victorious. The story of David and Goliath explained and supported this self-perception with David being the faithful and courageous Israel, and Goliath the big, strong and Godless nations surrounding Israel. 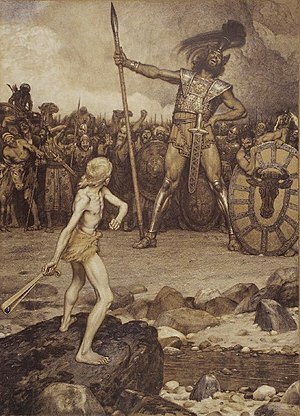 In some other cultures David and Goliath also has a mythic function even if the symbols change. In the United States, for example, the high value placed on the individual and individualism gives a different interpretation to the story. Goliath is the powerful unfeeling corporation or government bureaucracy. David is the seemingly powerless individual. However, when he stands on the side of what is right and refuses to give up, David (and individualism) can again be victorious. Since missions involves expressing divine truth in a way that is accessible to a specific culture, the proper use of stories with mythic or parabolic functions within the culture is valuable. Few people are impressed by propositional truth. Most find narrative as being more compelling… as long as it hits home with the culture it is shared in. Thus, understanding the culture and utilizing (or creating) stories that resonate mythically or parabolically is vitally important for being both an agent of change as well as an agent of preservation.